TRIBES OF ATLANTIS FORUMS • Flight of a Kings Golden Sandals. Flight of a Kings Golden Sandals. Post subject: Flight of a Kings Golden Sandals. The Turin Canon of Egyptian Kings starts off with the title II,11:Menes and ends at II,25:Aaka. 10 Kings are missing prior to Menes to account for Turin II,1:- II,10 and II,14: is also missing. In any case the count for section II is 25. If the missing II,14 is a type error and the count should be 24,I am uncertain although it appears apparent because Djer and Djet follow another in kings lists and a missing 14 would indicate an unknown king between djer and djet. Section V is missing 13 kings but yet a count of 25 is maintained. Why the numbers are not viewable and in proper sequence with a note of lost king or unknown I am uncertain which questions how they knew the proper count. I can only presume the papyrus was damaged at the missing counts and this is the best conclusion of modern scholars. The indication of the Turin Canon list is that there should also be a section I,1: with another 25 kings more or less, plus the missing 11 kings of section II: would total 36 kings which can also be confirmed by the Palermo Stone based on a 24 inch width @ 0.65in horizontal square spacing for the kings. (36.9 kings). I find it ironic that the Narmer Palette ca.3200.bC(Menes),on the Lower Egyptian side displays 10 fallen Kings which could have been the missing 10 Kings of section II,1-10: for the Turin Canon. Both the Narmer Palette and Palermo stone indicate kings of lower Egypt prior to Menes. XI = 17 (end of list) Total = 254 kings missing = actual number in sequence on the list. We can propose that each section should average 25 kings plus 11 missing prior to Menes would total some 36 kings missing if we are to perceive that the Turin Canon should also have a section I:1-25 prior to section II: with Menes. Considering an average of 30 year generations per king would equal 1080 years of kings chronologies. With the current 3200.bC for Menes plus our 1080 years would be 4280.bC. This would be around the advent of the Egyptian Calendar ca.4241.bC and also in relation to the Palermo Stone Kings list. The Palermo Stone is the broken piece (0.435m-H,0.25m-W,6.5cm-D) of a middle section of stone slab said to have been some 7 feet long by 2 feet wide and found laying on it's long side. The broken piece of stone was inscribed on both sides with kings of Egypt for the 1st to 5th Dynasties, the length of years they reigned and the foremost account for each year such as religious feasts, battles or cattle counts. Prior to Pharaoh Menes of the first dynasty there are only 9 Pharaohs visible on the stone who are all kings of Lower Egypt. It has been estimated that there may have been some 120 Pharaohs prior to Menes on the stone as Prof. James Breasted stated, although some may have been Gods or Goddesses and space may have been taken up for religious or creationist stories. The estimate above of 120 kings prior to Menes, would have to be based on the rows extending the length of the stone at 7ft. If that is the case, this stone would have had to been mounted on top of a table lengthwise to be able to read both sides of 9 rows per side. I envision that the stone stood 7ft upright and read from top to bottom and right to left, which would then be scribed with 30 rows per side of a 2ft width. In this case only some 36 kings would be prior to Menes and more feasible in regard to the Egyptian calendars origin and the missing kings of the Turin Canon's Sec;I,1-25 + II,1-11 prior to Menes. In any case, at present I am unaware of the actual setting of the stone if upright or lengthwise where in my opinion seems to be upright. Row 1 = approx 15 kings names lower Egypt. 4 rows avg.12 years per row @ 0.25m wide = O.82in. square spacing per year. Approx 760 years (less first row of kings side a) + 860 years side B = estimated 1620 years. Height of horizontal rows and kings squares prior to Menes appear consistent in size. Of the 9 Pharaohs visible prior to Menes,2 cannot be clearly identified. ____-pu (pw); Seka (Sk'); Khayu (H'-yw); Teyew (Tyw); Thesh (Ts); Ne"heb (N-"hb); Wazenez (W'd-'nd); Mekh (Mh); ____-a. The above list was made by Paulo Riven and is subject to accuracy and/or corrections. 279/3 = 93.gen.x 100.yrs = 9,300.yrs 9,300 + 526 = 9,826.bC. 341/3 = 113.67 gen.X 100.yrs = 11,367.yrs 11,367 + 526.= 11,893.bC. 8,133 + 526 = 8,659.bC. Modern record. 3200(Menes) - 526 = 2,674.yrs/244 = 10.96.yrs per king. Herodotus-341 X 10.96 = 3,737.36 + 526 = 4263.36.bC. Turin Canon-279 x 10.96 = 3,057.84 + 526 = 3,583.84.bC. Turin Canon - 10 missing kings prior to Menes = 3200 - 3300.bC. Eye of Ra Destruction of Mankind = Hathor worship = Flood - 3250.bC. The catch 22 is that it is acceptable for Herodotus to say that 341 kings totalled 11,340 years based on 33.33 generations each, however , the answer is in the length of the kings reigns which is quite different than generations. A prime example of this is the Hebrew count for the 10 generations of Adam to Noah based on the ages that they had sons which was 1656 years to the flood. But the lifespans of the 10 patriarchs totalled 8225 years. I am of opinion that this is precisely what Plato wrote in Solon's legend of Atlantis, when the Egyptian Priest stated 9000 yrs, they were referring to generations rather than actual length of rulership as our records of Egypt reveal so far as is known intelligable. Compare 279 Kings @ 33.33 generations = 9,299.07 years or 244 kings(Menes) = 8,133. years, which clearly reflects the Egyptian Priest (Uadjahor Resne) stating that Egypt was founded 8000 years prior in Plato's(360.bC) preservation of Solon's(564.bC) Atlantis legend from Sais,Egypt in the time when Pharaoh Amassis was seated. *-Ancient Records of Egypt,James Henry Breasted.Ph.D,Chicago,1906.aD. Apollodorus' kings list of Berossus. Mathematicaly,the Babylonian base system of 1,6,10 and 60 is acceptable for the saroi table above as simple tools for counting. For the Antedeluvian kings of Babylon,the term 120 sari becomes nothing more than a religious myth based on the concept of 2 hands totalling 120 saroi. (10 fingers x 6 x 2 hands) This was due to the fascination with 6 and 12 that derived from our body parts,(2 arms,2 legs,1 head, 1 body) or (2 eyes,2 ears,1 mouth,1 nose) and the spaces of 3 on the inside of each finger and 2 for the thumbs. It would be like saying that each finger was 12 saroi(43200yrs) for 1 king totaling 60 saroi per hand(216,000yrs) for the divine 120 saroi. (432,000yrs) Now Gods may rule 432,000 years in Babylon or 4,320,000,000 years for 1 day of Brahma in India,but humans cannot in mortal form rule 43,200yrs. We can adapt the indian concept for Babylon that 1 day would equal 1 God's year totaling 1183.56 human years for 120 saroi of 432,000yrs which would equal 9.86 years per sari. The oldest king being 18 sari would have been 177.48 years,so we can see this still seems incorrect. If we take our 9.86 years and divide it by our Herodotus factor of 2.79 yrs, we get 3.5 yrs per sari which gives 63 years rule for the oldest king of 18 sari. In reality,the humor is that in respect of the kings,the sari is actualy only 1 year,totaling a modest 120 years for 10 kings rulership which we can compare to the modern average of 10.96 years for our Egyptian kings lists. The rest is just divine fantasy for the basal 6. As compared to the chart below and a 2.79 divisable error factor for Herodotus' account of Egyptian kings, we can visualize that 1 sari is actualy only 1 year for the 10 antedeluvian kings of Babylon. But let us say that since each king sits on 1 of our fingers of 3 spaces to reveal the mystic secret of Babylon,that 3 should be our base of memory for transforming the antedeluvian kings. This would then be 30,9,39,36,54,30,54,30,24 and 54 for Xisuthrus totaling 360 years or a respectable 36 years per king which would also compare to the common statement of 3 generations is equal to 100 years by Herodotus,Solon or Plato to name a few great thinkers. If we add the flood date of 3250.bC to 360 = 3610.bC for the first king Alorus of Babylon. Alexander Polyhistor stated that there were some 86 kings after Xisuthrus to the Medes invasion of Babylon. 86 x 30 = 2580 + 620 = 3200.bC. 622-608 Cyaxares the mede takes Nineveh.(ca.620.bC). 86/3 = 28.67 gen.x 100 = 2867 + 620 = 3487.bC. A 30 year generation comparison for the Phoenician myth from Cadmus by Paulo Riven. As being told by Eusebius of Caesarea. Taautus. (Thoth, Thoyth, Hermes), son of Misor, alphabet........2697..later deified as God Tauthus. Astarte, Rhea (Ehea) and Dione sent by Uranus vs Kronos......2277..retained as wives by Kronos. Eimarmene, Hora and Allies sent by Uranus vs Kronos...........2247..retained by Kronos. Records preserved by Suduc's 7 sons the Cabeiri and 8th brother Asclepius by order of Tauthus Gods. Semiramis, Queen of Assyria (750-800.bC)? Translated into Greek by Philo of Byblos in 9 Books. *Cain and Abel,the first sons of Adam are missing.? Masoretic text places the flood in bC.2350 (Klaproth). from the Exodus to the building of the Temple of Solomon 757 years; from the building of the temple to the captivity of Israel 425. Altogether 4880 years. From the captivity to king Alexander 318; from Alexander to Christ our God 303. Altogether 5500 years. And from Christ to Constantine the Great 318; from Constantine to Michael, son of Theophilos, 555. The whole span altogether 6375 years." - end quote. Age of Taurus = 2000-4000.bC. 1013/2.79 = 363./10 kings = 36. years allowable for maximum length of rule. ....................Atlantean war ends, Atlantis island sinks, Mediterranean cultures perish. .........................................Feb.15th, 2009.aD. (8491.aJA) today's date as posted. Post subject: Re: Flight of a Kings Golden Sandals. It would be of too great a length to go into detail about all the Atlantean cultures, when in truth, we only need to realize that since the island of Atlantis was our old middle earth and where The First Garden of Life originated, that we all are actualy Atlanteans who descended from the Island of Atlantis. Consider also that around the time of Atlantis' disappearance that we find advanced and mysterious cultures popping up like the Egyptians and Sumerians. 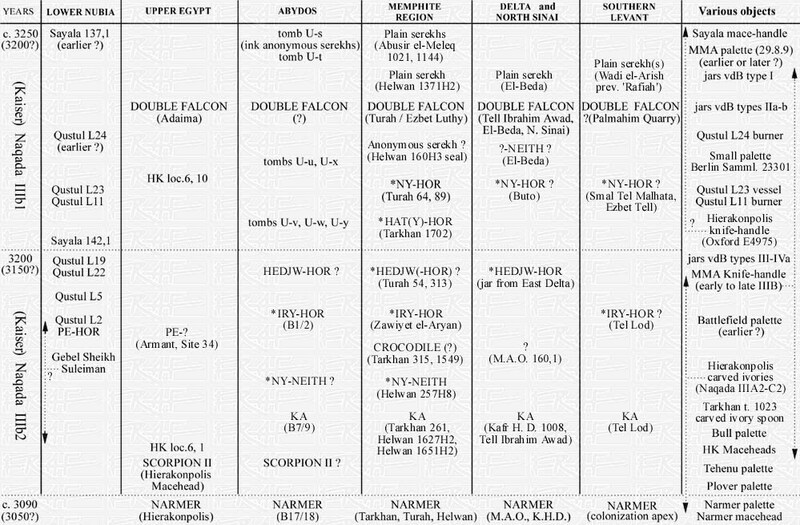 The Chart below from Francesco Raphaeles great website on ancient Egypt, reveals the major worship of the Atlantean Double Falcons circa 3500.bC. Tatanen, is the Egyptian word for the primordial place of creation westward of themselves, which compares with Atlantis. When we draw the name Atlantis with Heiroglyphs, we use two falcons for the letter A! Atlantis may have been known as Atatana or Hat nt iw, which would mean "Foremost Island of Neith" which also compares to the term Khenti-amenti or Foremost of Westerners. Herodotus and modern scholars, so the kings pre-dynastic kings of Manetho are either too short in solar terms or too long in lunar, that is with an exception for the 10 Thinis kings. Adjusting the Shades and Demi gods compliments what I suspected in my Flight of a Kings Golden Sandals paper that since Menes is "labeled" as II; 11:, that II; 1-10 should in fact be those Thinis kings. So the Gods and spirits should all be under section I, other kings as II, 30 memphite kings as III and the 10 Thinis kings and Menes under IV which we would have to recategorize the remaining Turin king list. The interesting thought is that the noticeably short reign of these 10 "Thinis" kings could be due to that they all ruled contemporary of each other and all died as indicated on the Narmer Palette by the 10 headless Kings. This also supports a thought as to why the Egyptians wanted to "control" the 9 bows thought to be Nubian tribes. Why 9? Why not 7 or 4 or 21? And if the bow was the symbol of power and control, then he who controls the 9 bows must be the chief or 10th bow as symbolic of those 10 fallen kings also and the 10 districts of Atlantis. I recall some 220 modern kings to Menes from Psammeticus ca 526.bC, plus 40 is 260 and Manetho I think is around 330 while Herodotus is 341. That leaves another 81 kings for the category of "other kings", although uncertain if we should include Gods and Demigods in the 81 remaining. The Palermo stone gives us names of 9 kings prior to Menes and other relics like Scorpion, Crocodile, Iry Hor, Ka, Hat Hor, etc. Prof. James Breasted stated that he expected some 120 kings lengthwise, including the 9 kings identifiable. Roughly 25 kings average each section of the Turin King list, so we can surmise this number for other kings which leaves us with 56 extra kings to account for 341 Herodotus kings. We're only 22 years away from the Egyptian calendar of 4241.bC! We are given a total of 1857.3 Solar years for Gods, Demi-Gods and Spirits. That's only 362 years from my 6482.bC date for our new Earth which can be easily made up with a +/- factor of Kings or Gods!Where we can also consider a more proximity to 6482 in that the 10 Kings were wiped out by the 3253.bC Biblical /Hathor flood and why Menes (Narmer) who dates around 3200.bC is thought to be the first King of Egypt. When Ra destroyed mankind, he did so with the Eye of Horus as Hathor who is also equated with Hapi and the inundation flooding of the Nile. The Hathor bulls on the Narmer Palette and the Bull destroying the fortressed city on the bottom can also be viewed as being destroyed by a flood and not necessarily the King, which I believe is attending a funeral procession, hence the bare feet and scholars suggesting that Narmer came upon or "found" the Lower Delta in this state with the 10 fallen Kings. 40d (Nt. 284). To say: From (or "in") the place where they fell. Ḫr.t-sea. 49 + 3 (Nt. 32 1). To say: Osiris N., thou livest, thou livest. Rē‘nḫ; An‘nḫ. 54a. Osiris N., I bring to thee the eye of Horus, which he took from thy brow. Ḥȝt.t Tḥnw. 57d. that be may stand before the spirits like Anubis, "First of the Westerners." 121b. For he (N.) is indeed the great bull which smote Kns.t. 150c. I am come to thee Mśḫȝ.t-kȝ.w; remember him--N.
Obviously the Phoenician chronology is corrupted as they also are descended tribes known as the “real unruly Atlantean” mentioned by Critias, or in general the tribes with the “PH” name from Phanes who was Lucifer. These are the betrayers of Atlantis and the cause for the war alongside their satanic sacrificial rituals upon the altars like the Son of Man or The Christs throughout the Aeons. (Eras of JA MN) and Evanor up to Jesus The Christ or Kristos Kureos the Golden Orus or (Son or Sun) in exchange for their black Hora or Horus followers of Phanes the Black Horus. Here we also find that Philos of Byblos was Josephus the Hebron Jew and that the Hebrons are descendants of Huni, Snoferu, Khufu and Khafre who became known as the Phoenicians from the Pharaohs of Egypt, the Atlantean colony from Atlantis. Hebron is thought by archaeologists to have existed around Khufu or ca.2600.bC alike Sargon of Babylon. In my Flight of a Kings Golden Sandals paper you will find the chronology of the Phoenician Priest, Sanchuniathon as told by Eusebius of Caesaria and dated according to 30 year generations from Cadmus to Aeon. Notice that Sanchuniathon is close to Thoth at the end, where his knowledge came from the Ammonians of Egypt. Naturally, this list is not accurate but a good basis for an attempt to re-structure and contemplate the correction with consideration of names being merged with different times or people. What we provenance is that the Phoenicians like I have done with the first Dynasty kings of Menes or any 10 kings of tribal nations in antiquity, validate their origins and ancestors from God JA MN’s (Aeon) Foremost Island of Atlantis that was known by the name of Hat.Ta.Ntr.Iw or Foremost Island of our God, JA MN (Ta = TJA or Ta Ja God’s Earth alike the Djet pillar or “of JA”). Amenti for Seker’s Atlantis island (Scheria of Homer) and Tatenen to the Egyptians as the primordial mound of creation from Nun’s realm of the Atlantic. (Cleito’s Hill, Neptune). Within the Phoenician chronology as they them selves tell us, we find that they are also a corruption of the Eleusian Mysteries. (Elu Master to the Phreemasons) or the Greek Myths. (Corinthians) or the Sun Temple worship of the Heliopolitans like our Occult secret societies of “VULCAN” today who still worship them and the many different names they go by like freemasons, jobes daughters, oto, rosicrucians, knights of malta, templars, Jesuits, golden dawn, illuminati or just plainly the truth as the New World Order in disguise of the Zionist Masonic Oligarchy of Phanes who did 911 for the Red Shields or Red Dragon Servants of Vulcan, thus Lucifer satan, alike all your wars, terrorisms, subjugations, plunders, murders, governments, central banking systems and media corruptions that also include altered histories or subliminal programming for your horse blinds of One Eye or One Law of their Pyramid! For Surely by the Hole of Their Law will thou Wilt in blindness and eternal confusion! Evanor or EUANor would mean “most high (Uah / sky) of AEON = AEJON = JA MN. His name also means “sacred, to arrive with strength, vanishing = Power of God and Atlantis disappearing. Evanor became known as Aeon, Ousous and Ouranus to the Phoenicians and Ouranos or Uranus to the Greeks and Oannes to the Sumerians..
Neptune, The Atlantic Sea God, Nun to the Egyptians and Nereus to the Phoenicians. Menes of Egypt would later be alike Evanor for their love of sailing and fishing and also appearing to the Sumerians as Oannes, the Fisher King, thus the Narmer fish symbol, which could also mean he was born a Pisces, waters, sacred birth, perhaps alike Evanor. It is also clear and proven that we know Menes’ wife Neith was fashioned after Leucippe, Evanor’s wife, therefore Menes and Neith preserved the Atlantean histories and 10 kings as evidential by the 10 kings of the Narmer Palette and the names of the first 10 kings of the first dynasty. (Actualy, 9 kings and 1 Queen MerNeith as Evaemon or “beloved of Maerea” the Atlantean province settled from Atlantis in the Delta Nile district of Egypt that included Sais, Buto and Mennefer, the fortressed city of “Enduring Beauty of Menes”, not Hiku-ptaH, the later corrupted name, nor did Menes enstate Ptah as we are led to believe, but rather he was dedicated as a “Follower of Amen” or Min or JA MN, which is the true meaning of the Falcon on the Standard and not the corrupted Horus or Hathor who also became Astharte or Isis as “She of the Horns”. Which is why Osiris’ body appeared in Phoenicia under the cedar trees of the Libanus forest of Lebanon or place of the evils of solomon’s horror house of satanic rituals, thus Sirius Anubis! The story of Seth slaying Osiris was carried on as Cain and Abel in the bible. Much like Isis or Astharte would have been to the Egyptians or Assyrians but sadly PtaH, Ausir, Aset, Horus and Astharte are born of corruption and evils for eastern worship of Sirus the star of Anubis, thus the dog star name of Black Jackal predators. In other words The Khufu evil family, sun worship, solar calendars, Satanism, ritual human sacrifices and cannibalism since Raneb The Goat of Mendes who corrupted AMEN or MIN or JA MN and was the first to use the Evil Eye of Ra symbolism in his cartouche. 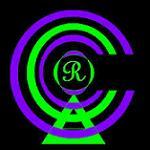 Ra simply means king like Re is Queen, thus Rhea or Rhaim. The Phoenicians from Atlantis settled in Egypt and went on to Heliopolis then the levant as the Hebrons where the Hebrew Jews came from and not Babylon or AbraHam, but rather Abraam of Egypt or the Hamites that are properly the Ammonians or Amites or Amorites. How this all came about was from the Second Island of Atlantis as Tansania where JA MN’s Garden of Avila and re-creation after the island of Atlantis in the Atlantic restarted after the first flood of 6482.bC and the destruction of the original Atlantis in the Atlantic. Then the second flood of 3250.bC or our biblical flood memorized, destroyed the Second Atlantis also that was revived in Maerea, the Delta Nile. Tansania was a large oval island with a concentric city being the Olkarien Gorge where the Garden also is as a twin reflection to Atlantis alike the ruined straites of Eritea and Erithea. Evermore, the symbolic meaning of the Ark of the flood sailing to and landing on Mt KilimanJAro with the kings and queens of Atlantis, where Japeth or Japetos to the Greeks is also memorized as the father of Atlas or the Javan cultures of the Mediterranean! Japetos had a wife named ClyMene who is also known as Asia or testimony of that the Asiatic cultures also came from Atlantis like we all did! – Paulo Riven, Tribes of Atlantis. Here is reconstruction of the Phoenician chronology that was corrupted or changed by them as well as being equated to different people at different eras for their own vanities and ignorances. Further evidence of their origins from Atlantis as Egypt also is. Keep in mind that the names of the 10 Atlantean Kings were forgotten but their meanings and actions preserved and passed on either orally or written as hieroglyphics or letters as the Sacred Records of Neith’s Temple of Sais, Egypt indicate or as Critias stated ca.420.bC and preserved by Plato ca.360.bC. Aeon - first mortals of Phoenician myths. - Ousous first to sail, Oannes sailed to Sumeria. - Memrumus, Hypsuranius sons of Aeon (Evanor ) - Hypsuranius settled Tyre. -Tyre first Atlantean city settled in Phoenicia prior to Sidon and Byblos. 7 Titanides or Artemides daughters born to Kronos. Astarte, Zeus Demarus and Adodus (king of gods) rule Phoenicia by Kronos. Zeus Belus, kronos II Apollo born in Perae to Kronos. Baetylus, stones of Atlas or Pillars of Hercules. Kronos gives attica to Athena, his daughter. As you can see, Kronos, Siton, Zeus, or Dagon are all corruptions of Atlas like Hercules and distorted truths for a very dark purpose. Where clearly we see the betrayal of the “PH” cultures to Atlantis and the cause of the war leading up to the 2nd flood of 3250.bC. Melcathrus may have been a son of Atlas to who was also portrayed as Hercules who identifies with Atlas in the Greek Myths, or Antaeus the Giant of Libya. Dagon or Siton may have been Sargon of Babylon after the second flood. Kronos falsely replaced Atlas, then desiring to be a god, separates himself and replaces Jove as Zeus, Zeus Ammon or Zeus Belus, thus Zeus and Kronos are the same person. Kronos or Zeus Belus or even this Poseidon must have been a Hyksos king from Phoenicia or Babylon as the names identify with ca.1500.bC when the Hyksos slaughtered the Egyptians as the Chanaanites of David. This would also explain why Zeus Belus was also equated as a King of Egypt as well as Babylon and memorized by the Greeks, thus they became “Hellanized”. Perhaps a descendant of Sargon of Ur, Babylon as a corruption of Siton or Sidon, where as Gilgamesh would also portray Melcathrus for Hercules and Utnapishtim as Diaprepes or Chrysaor. Thus Gilgamesh searched for his Atlantean ancestor Utanpishtim who was also the last king before the flood. Evanor passes on and Atlas is defeated by Kronos. (Hellanized Greeks, Egyptians, Phoenicians, Phrygians of the Phanes “VULCAN” cults battle the Atlanteans, Kronos slays Atlas. Atlantean King Diaprepes – Written knowledge of God. -Chrysaor – The Golden One, Priest, first to voyage - Diaprepes, Noah's Ark. Flood of 6482.bC later transferred as the biblical flood story after the flood of 3250.bC and Utnapishtim for Gilgamesh. Clearly we see a strong comparison to Atlantis alike that of Egypt! May not be perfect or actual characters verified as proof, but evidence evermore! Then the Heiroglyphics and Heirophants change and mix everything up with truth and lies like the zeitgeist bible of satan disguised as God, yaHoVeH, the hooved one of vanities, blood lust and ruins! In other words the Phanes Philos of Lucifer known today as the Phreemasons and the Zionist Phoenicians! A 5500 year old war that continues today with their cries of “thou shalt be put to death”!! Evermore in meaning that a lot of thought over the years where ones lifetime is to their advantage to cover up histories prior, went into altering and changing the true meanings of the hieroglyphs as evident by plaster over layings or defaced scribes, thus the “ROSIE CROIX Greek/Egyptian stone of the Philos and ChamPHollion! Just like ZAHi HaVas continues their works today to hide Atlantis because this Earth and all it’s lands are deeds titled to Atlantis! Even the Red Shields or ZMO can not afford those kind of back taxes or scams that still are be counted for by our True God JA MN! Thus their engraved tombstones for the Pit of The Calling in XHenYAH’s home of Phanes where it fell and is Zealed!!! Evil arose from Kenya’s Rift Valley where the Red Shields also call their home as the “Giraffe Mansion for PHILAnthropic lies” for the Red Dragon of todays ZMO! Xhem or Khem (Chem) the “Burnt Ones” therefore gave it’s name to Egypt as Khemet where dung beetles are highly praised and Hebrews of Khufu and Hebron bake bread out of Neat’s Dung as their god told them to do! Neat = Cow, thus the Corruption of our Sacred Neith into Hathor and Zekhmet, the bloodthirsty Evil Eye of Ra that slaughtered mankind for the flood of 3250.bC.! From Egypt it spread to Phoenicia and Babylon and the Voodoos of Africa! Thus our True Garden was tempted by the Serpent in Tansania, then they changed it to TanZAnia…….see? The Hebrew 72 Rabbis of the Pharaoh Greek Ptolomy who knew not God’s name in deception of 72 questions and praises of vanity upon Pharaoh, changed the original Hebrew again that became your bible and the fall of the Library of Alexandria for the library of ByZAntine Pergamon. Whereas the bible is continuously altered like Ben Asher ca 11th century aD. 72 Rabbis = 72 Dark figures of Osiris and Anubis = 72 Sepheroths of Kabaalah = 72 Lies of Virgins = 9. For our True God JA MN or 1 was bothered by the 8 or Zatan = 9 = war. Sargons 8th son, perhaps unknowingly at this time was this Asclepius of a mountain nymph named Anobret (Goat-Mendes worship started by Raneb ca Sargons time or 2700.bC). Asclepius may have been this Ledud who was sacrificed upon an Altar, probably at the Golan Heights, alike to AbraHam sacrificing his son there as their god commanded of his humbleness duty before him. Thus the H was added to Abraam as it also was to H-Umans. This would show that the first Phoenician came long after this line of the kings or gods, and that he was a foreigner, as compared with them; and, therefore, that it could not have been the Phoenicians proper who made the several inventions narrated by Sanchoniathon, but some other race, from whom the Phoenicians might have been descended. Mestor and Mneseus of Plato are probably the gods Misor and Amynus of the Phoenicians. This article submitted as evidence and help for your ancient studies is subject to verification by further research. First we must plant the seed for the flower to grow! A bit of a long read but worthy of consideration for those adept to seeking knowledge and not overcome by the sin of sloth!